I have returned home one day early from Quilt Market so that I can sit here in between power surges and outages from Hurricane Sandy to bring to you some of the sights from Quilt Market. First all is well here, we made it home safely, but now we ride out the storm. The first day at Quilt Market is always fun, we get to go to schoolhouse. Hopping from room to room seeing new and exciting things that designers, authors, and companies have to offer the quilting world. Let's take a peek at some of the things that I saw. These fabulous bags, baskets, and tuffets are made with batting strips and pre-cut strips they are super cool and sturdy too. Love the look! What do you think... should I carry this pattern line in my shop? Then off to class with Bill Kerr... our most popular modern quilter. Fabulous quilts and a great new fabric line. You can find their books and patterns in my shop here. Next up my friend Deb Tucker, from Studio 180 Designs. Her wonderful quilts made with her ingenious rulers and patterns that can be found in my shop here. Then my good friend Victoria's debut!! 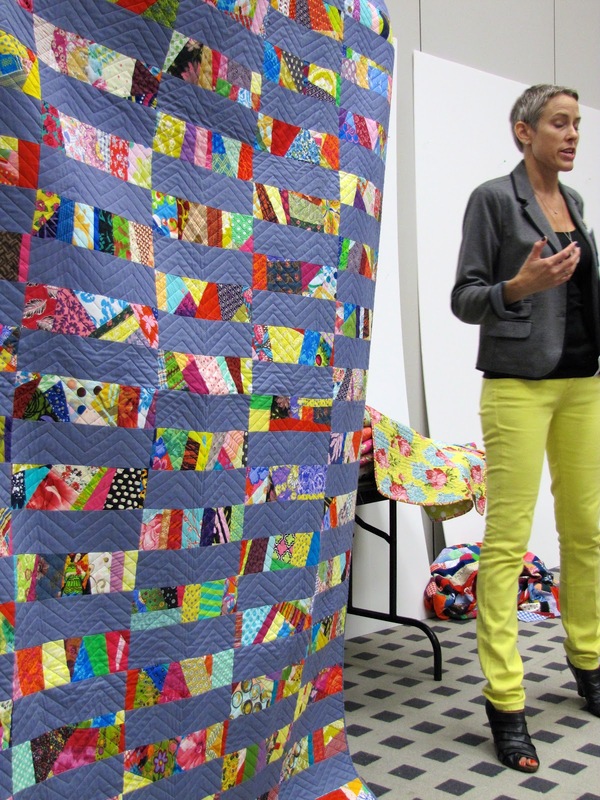 Here you can see her presenting her schoolhouse trunk show featuring quilts from her NEW book 15 Minutes of Play. The book is fabulous! I have my autographed copy and LOVE it!! Victoria ROCKED the schoolhouse... not only that her pants seemed to match her quilts too!! You will find her book in my shop in November... so stay tuned. Tomorrow, more market reports and photos!